A Nasa space telescope has launched successfully on a mission to explore the Universe with "gamma-ray glasses". The Glast mission will shed light on some of the most violent events in the Universe, that release massive amounts of energy in the form of gamma-rays. It will scan the sky for massive cosmic explosions, giant black holes that hurl matter across space, and dense neutron stars with powerful magnetic fields. Glast blasted off from Florida on Wednesday atop a Delta II rocket. The Delta II began its climb to orbit at 1605 GMT from Cape Canaveral Air Force Station. "Glast soon will be telling scientists about many new objects to study, and this information will be available on the internet for the world to see," said Dr Steven Ritz, the chief scientist on the mission, who is from Nasa Goddard Space Flight Center in Maryland. Glast stands for the Gamma-ray Large Area Space Telescope, but Nasa is calling on the public to come up with a new name for the mission. The $690m (£350m) space observatory will take high-resolution pictures of the gamma-ray sky. These rays are the highest-energy form of light, which makes them ideal for exploring some of the most extreme environments in the cosmos. These are places where nature harnesses energies far beyond anything possible on Earth. They include supermassive black holes at the cores of galaxies. These black holes produce powerful jets of matter, moving at close to the speed of light, which can travel vast distances across space. But despite the staggering scale and speed of these jets, astronomers haven't been able to answer the most basic questions about them, such as how matter is accelerated to such fabulous speeds. 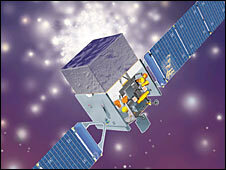 Glast will also seek to investigate the mysterious cosmic explosions known as gamma-ray bursts (or GRBs). These events release about the same amount of energy in one second as a star like the Sun will release in its 5-10 billion-year lifetime. "We've only scratched the surface of the how and why of these gamma-ray phenomena," said Dave Thompson, a deputy project scientist who is also from Nasa Goddard. "We have a lot to learn about how they work, and, more importantly, how these objects and phenomena affect the Universe. This is where Glast comes in." The mission will also go in search of new physics, aiming to shed light on the nature of the dark matter which makes up some 22% of the Universe. Glast represents a major step up in capability on previous gamma-ray telescopes and will cover an incredible range of light at the high energy limits of the electromagnetic spectrum. "If Glast were a piano, it would have about 23 octaves," commented Dr Ritz. "With such a great leap in capabilities, the most important things for us are the surprises." The main instrument aboard the spacecraft is the the Large Area Telescope, or Lat. Gamma-rays carry far too much energy to capture in the conventional way, so this is a telescope without lenses or mirrors. Instead, the Lat uses silicon detectors and layers of metal foil to track the energetic radiation from outer space. Once Glast reaches orbit, about 14 days will be spent checking out the spacecraft. In the third week after launch, the spacecraft's instruments will be turned on for tuning and calibration. The mission is a collaboration between Nasa and the US Department of Energy, with important contributions from partners elsewhere in the US, in France, Germany, Italy, Japan and Sweden.